Have you discovered Spring Smart running on your operating Windows system? This undesirable application could have been installed together with other suspicious programs, and this is quite likely since the official download page at springsmart.net is currently inactive. In fact, it not highly likely that many people would install the extension themselves anyway, simply because it does not provide extremely beneficial services. Yes, it is free; however, it does not mean that you can benefit from it. This is exactly why the developers of this app are likely to use software packaging techniques to drop it onto as many computers as possible. Have you already noticed the plugin running on the PC? Then we recommend that you remove Spring Smart. Even though Spring Smart is supposed to help you save money by providing money-saving deals when you visit online shopping sites, it has been discovered that the extension provides irritating adverts more often than not. In fact, many third party advertisers rely on this application to promote their ads, and not all of these parties are trustworthy. Our researchers who have reported Searchadence, Fassurun, Squirrel Web, and similar computer applications in the past warn that staying cautious about the displayed ads is the best thing that you could do in order to avoid any virtual security breaching risks. 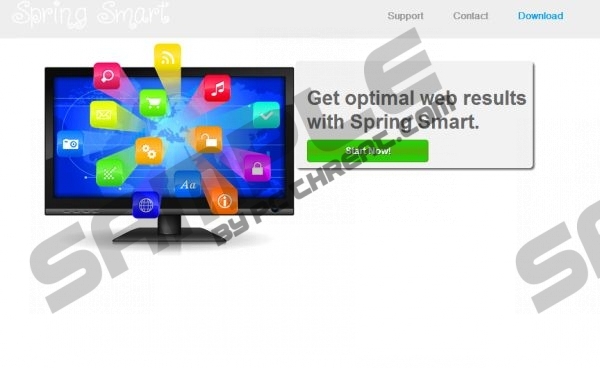 To delete Spring Smart from the computer you can begin by having the undesirable plugin deleted from your Google Chrome, Mozilla Firefox and Internet Explorer browsers. We recommend that you perform this task by getting the unwanted program removed from the computer. Have you already performed the steps presented below? If you have we advise that you immediately examine the system with a scanner. Click the download button below to acquire a free of charge scanner, and if it detects any threats – upgrade it to a full-feature security tool which will remove any dangerous PC infections. How to delete Spring Smart? Select the undesirable application and click Remove to get rid of it. Move to Uninstall a program and locate the program you wish to remove. Click Control Panel and then move to Uninstall a program. Quick & tested solution for Spring Smart removal.